Inspecting a specimen of titanium, Science Museum, London, c 1988. Coins from the Duke of Northumberland's collection. Deformation of a cylinder, string surface model, 1872. Ordinary copper ore from Alderly Edge, Cheshire. Small bras coin believed to depict Alexander the Great, 330 BC. Rock fragments from Mount Vesuvius, c 1770. Hydrographic map of the Persian Gulf, 1712. Skew surface with its tangent paraboloid. String surface model, 1872. 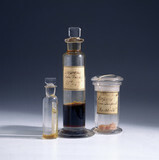 Synthetic rubber specimens, c 1892.